Classical pianists Ina Allen and Barbara Kemp, in sharing the adventures of Nanushka, bring together music-making and storytelling into one art form. This combination is a great way to introduce young audiences to the rich tradition of classical music. The story takes place in a time long past in a remote Russian village. Little Nanushka lives alone with her Great-aunt Olga and longs for playmates. She resorts to creating make-believe friends, but this gets her in trouble with Great-aunt Olga. The piano duets as well as the words describe Nanushka's story. Follow her in her adventures as she fills her life with playmates. I will always remember Prokofiev's "Peter and the Wolf," introduced to me as a child. I didn't grow up listening to classical music, but hearing it made me aware of it and as an adult I had more appreciation of it. Ina Allen and Barbara Kemp have the same idea placing music with the story, making it easier for children to relate the story and the music. I married into grandchildren and have a granddaughter who loves classical music. She and her sister will be given this CD and I hope they love this. Nanushka - Great for kids! Nanushka is a fascinating blend of classical music and children's storytelling. A fantasy, much in the vein of "Peter and the Wolf", this narrated, heartwarming story captures the spirit of traditional Russia. The story segments are interspersed with wonderful pieces of classical music. 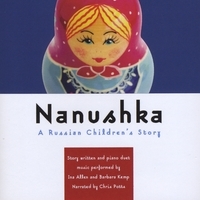 As an elementary school teacher and early childhood specialist, I believe that Nanushka should be promoted in libraries, schools, and music/theater venues. An excellent way to introduce children to classical music and folktales. I wish my children were still in the ideal age-range for this charming story interwoven with equally appealing music. But folks of any age will be captivated. It's remarkable how affecting the "surprise ending" of such a simple little tale can be. The Beethoven music at the end perfectly captures the new mood. Let's have more from Ina, Barbara and Chris!